2 Halogen lights highlight important parts of display board. Customizable header can display your company logo. 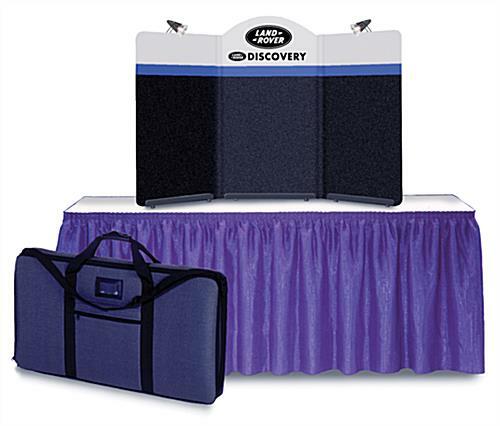 Table Top Presentation Display - 3 panel folding mini trade show display with reversible black and grey fabric for hook and loop fasteners (two displays in one). Left and right panels measure 18" wide by 32" high and center panel measures 18" wide by 36" high, giving a total display area of approximately 56" by 32". (Colored area is 24" high). 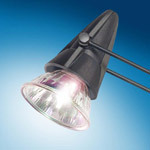 Includes a padded nylon carrying bag for safe and easy transportation. The white header included with this table top presentation display includes your custom 1 color text/logo. Please be sure to review the artwork requirements for your custom header. For text only headers please specify text and color in the "Special Notes" section of our order form. This curved (center) header measures 18"w x 5 3/4"h and 9 3/4"h on center. Headers not available for top of left and right panels. Don't forget to add other trade show essentials to your order. These include sign frames, brochure holders and hook and loop strip that make it easy to customize your table top presentation display.